I was so sad for this book to end! 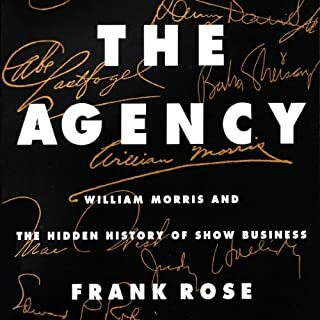 What made the experience of listening to The Agency: William Morris and the Hidden History of Show Business the most enjoyable? This book combined everything I want in an audio book: History, Hollywood, Business lessons, and a delivery by Marlin May so good it kept pace perfectly with Frank Rose's brilliant writing. I just wish this book went on forever. Elvis, Sinatra, Monroe. There were so many behind the scenes Hollywood tales about people that have impacted us, some famous, and many of whom we've never heard. Rose brilliantly weaves each individual person's story into the largest narrative of the Agency that has made such an impact for over a century. And while Rose has us in the palm of his hand with masterful storytelling, Marlin May sinks his teeth into every line and delivers us into a world of wonder and mystique of days past in a world that no longer exists. Together, they paint the picture of Hollywood's evolution through the lens of the William Morris Agency to perfection.